NEW YORK -- Ford Motor Co. and General Motors added a chapter in their bitter, crosstown rivalry at the New York auto show last week, this time in the full-size luxury sedan segment that they owned decades ago but barely register in today. Now, both companies think they finally have the car -- a revived Lincoln Continental for Ford and GM's Cadillac CT6 -- to rekindle past glory and pave the way toward a lucrative future in China. While the Continental and CT6 battled to make the bigger splash at the auto show, their head-to-head matchup likely won't have the same intensity out in the marketplace. Despite having similar goals, the two cars embody the divergent directions that Lincoln and Cadillac are taking to land on more shopping lists. Cadillac describes the CT6 as "a true driver's car," aimed at performance-oriented rivals such as BMW, while the Continental is more about passenger comfort and interior serenity, qualities valued by chauffeured Chinese customers. Lincoln President Kumar Galhotra said it's not for people seeking "really aggressive machines," a philosophy designed to take on Lexus rather than Cadillac or European makes. Instead, "they're looking for elegant beauty," Galhotra said in revealing the Continental Concept to a small group of media at a low-key event last week. "They're not looking for raw power. They want effortless power. We want to help our customers resolve some of the tensions in their lives." Cadillac President Johan de Nysschen gave a very different pitch for the CT6. "It wouldn't be a Cadillac if it didn't have excellent driving dynamics," he said, unveiling the car during a large, ritzy party at the Brooklyn Navy Yard. De Nysschen noted symbolism in having the event in a location that built American warships used to defeat European enemies. One thing the Lincoln and Cadillac sedans do have in common: Even if they represent good progress for both brands, the climb back to prominence is so steep that the German and Japanese makes that now dominate the luxury market have little reason to fear a dramatic American comeback just yet. 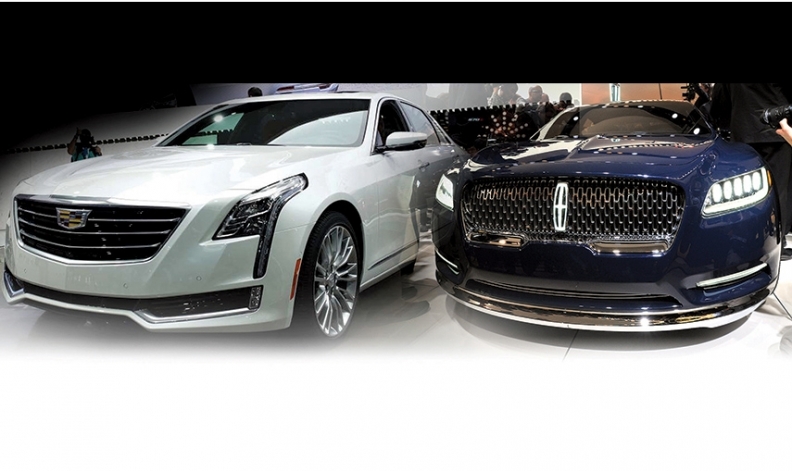 Stephanie Brinley, a senior analyst with IHS Automotive, said the CT6 and Continental show how the two brands have become stronger in different ways but said neither has achieved the full package necessary for its revival. Lincoln is further along in re-evaluating its customer base and marketing approach, she said, while Cadillac has focused more on the vehicles themselves. "The Lincoln Continental looks like it's going to be a big step for the brand," Brinley said. "CT6 is a step forward, but it's a small, incremental step. Cadillac has giant steps on the drawing board, but they're not here yet." The cars' names also highlight a fundamental distinction. In Continental, Lincoln hopes to build on the brand's storied history, while Cadillac has created a numerical system, following BMW and Audi's lead, to assert itself as more modern and break from its mediocre offerings in recent decades. Ford CEO Mark Fields, who decided along with then-marketing chief Jim Farley about 18 months ago to bring back "Continental" to replace the MKS, said reaching back to Lincoln's heyday will help with its revival. "The biggest challenge in the business is getting awareness," Fields said. The name helped raise standards during development, he added, because "you don't want to overpromise and underdeliver on an iconic nameplate." GM isn't the only automaker that Ford found itself locking horns with in New York. Bentley designers publicly accused Lincoln of ripping off the Flying Spur. "Do you want us to send the product tooling?" Luc Donckerwolke, Bentley's chief designer, wrote on the Facebook page of Lincoln's British design director, David Woodhouse. Lincoln officials brushed off the criticism. "I like our car better," Woodhouse told Automotive News. "This is a Lincoln, and we're very proud of it." Meanwhile, GM was more than willing to instigate the dispute. Asked whether Lincoln stole any of Cadillac's thunder at the show, GM President Dan Ammann responded: "I'll let the Bentley designers comment on that."